It has been found that catalytic deoxygenation of triglycerides is a viable pathway for obtaining renewable liquid fuels to contribute to meet the global energy demand. In this study, SBA-15 mesoporous silica was synthesized in a pure form and modified with mesitylene (TMB) as a swelling molecule (SBA15-TMB). Catalysts with 0.5, 1.5 and 3.0 wt% Pd were synthesized and tested by deoxygenation of stearic acid (SA), obtaining initial conversions of 68–98% that decreased to 36–73% after 6 h time-on-stream. The most abundant product was n-heptadecane, with a selectivity of ~ 90%. The most active catalyst evaluated with SA was 3.0 wt% Pd over unmodified SBA-15 (30Pd/SBA-15). 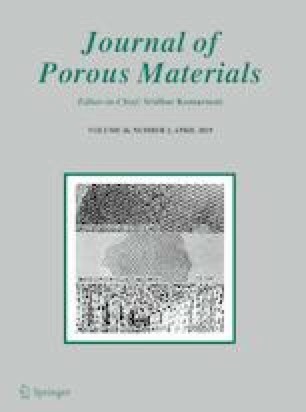 Subsequently, fresh and regenerated 30Pd/SBA-15 catalysts were tested with waste cooking oil (WCO) feed, obtaining conversions of 74 and 72%, respectively, but the fresh catalyst allowed a better oxygen removal (91%. Additionally, commercial Pd(10wt %)/C catalyst was evaluated, obtaining results comparable to those for the regenerated 30Pd/SBA-15 catalyst. The main WCO reaction product for all catalysts was a diesel fraction (C12-C21), and the quality of the products was not very different, following the order: Pd(10wt %)/C > 3.0Pd/SBA-15-regenerated > 3.0Pd/SBA-15-fresh. The results obtained indicate that shynthetized catalysts of this study are promising for obtaining renewable diesel from low-cost feeds while using low hydrogen consumption. This work was supported by Consejo Nacional de Ciencia y Tecnología (CONACYT) [Project of Basic Science No. 166640]; Bioenergy Thematic Network (“Red Temática de Bioenergía”), [Grant 260457]. Project 253986 is acknowledged for CHNS/O analyzes. Jose Gpe. Pacheco S. acknowledges the Programa para el Desarrollo Profesional Docente (PRODEP) (SEP -SES) and Universidad Juárez Autónoma de Tabasco for the scholarship and financial support for his doctoral studies. The results of IR analysis of both supports are shown in Fig. 11. The main bands of SBA-15 are observed in the range of 4000-500 cm−1. Four bands are typical of siliceous material: 500 cm−1 δ (Si–O–Si), 799.92 cm−1 υs (Si–O–Si), 988.01 cm−1 δOH (Si–OH), and 1084.34 cm−1 υas (Si–O–Si). The last three bands correspond to vibrations of the Si–O bond and are classified by the type of movement (swinging, bending and stretching) of the oxygen atom relative to the silicon atoms [63, 64]. 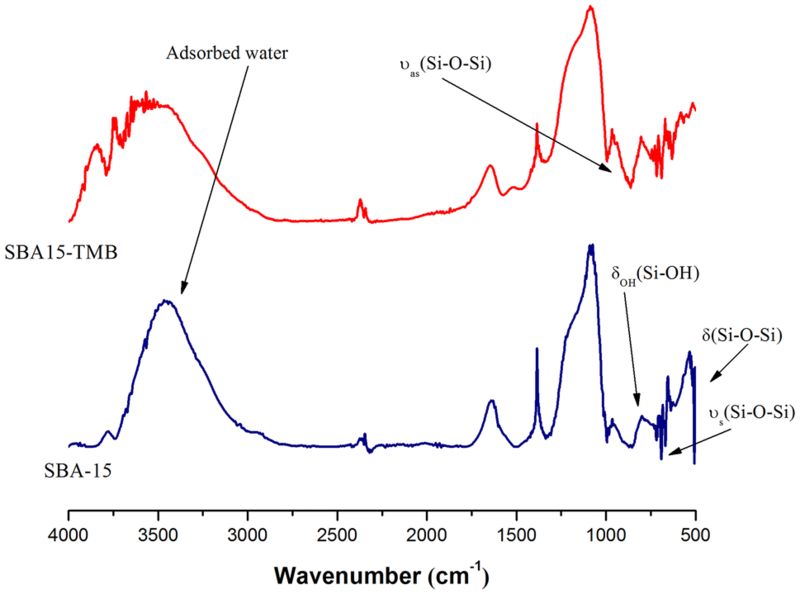 The SBA-15 material also presented other absorption bands characteristic of SiO2. The signal at 1610–1650 cm−1 corresponds to the deformation of molecular water, while the band appearing between 950 and 955 cm−1 is assigned to vibrations of Si–OH (silanol) . Moreover, in the material SBA15-TMB was observed that the addition of TMB resulted in displacement from 503 to 551 cm−1 of band δ (Si–O-Si) due to interactions generated by the swelling molecule. Table 9 summarizes the mains bands present in the synthesized supports and catalysts. 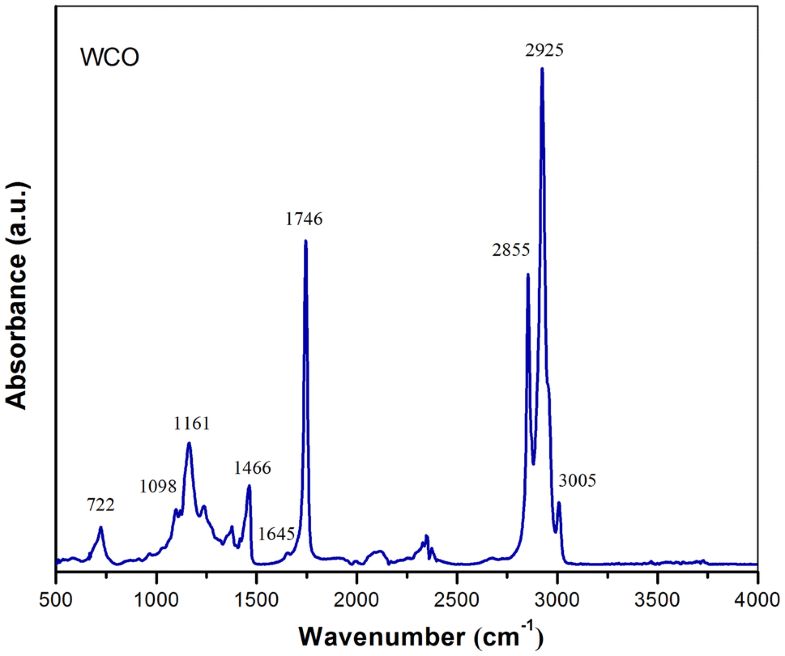 The IR spectra of the catalysts are given in Fig. 12. In the case of catalysts supported on SBA-15, some changes are observed in the signals concerning the silanol group (Si–OH), which for the catalyst with 3.0 wt% Pd was displaced from 988 to 967 cm−1. This displacement may indicate substitution of the OH group with Pd during impregnation. In the case of catalysts supported on SBA15-TMB, the band at 980 cm−1 that is characteristic of the flexing silanol group (Si–OH) diminishes in intensity as the amount of impregnated Pd increases. This result was confirmed by SAXS analysis, which indicates partial occupation of the mesoporous silica by palladium particles, causing a reduction in signal intensity; for the catalyst with the highest Pd content (3.0Pd/SBA15-TMB), this band was no longer detectable. Figure 13 shows the FT-IR spectrum of the WCO in the range of 500 to 4000 cm−1. Signals of TG compounds predominate in the spectrum. The signal associated with the stretching of the C=C bond of the aliphatic chains of triglycerides can be observed at 3005 cm−1. The small signal at 1645 cm−1 corresponds to the stretching vibration of the C=C (cis) group present in some of the unsaturated chains. On the other hand, the signal at 1466 cm−1 is mainly attributed to the scissor bending vibrations of groups CH2 and CH3, whereas that at 1374 cm−1 corresponds to the symmetric vibrations of CH3 groups. The two strong signals in 2925 cm−1 and 2855 cm−1 are attributed to the asymmetrical and symmetrical stretching vibrations of CH aliphatic groups in CH2 and CH3, respectively. The intense signal at 1746 cm−1 corresponds to the stretching vibrations of the carbonyl group (> C=O) of the ester in TGs. The signals between the bands 1161-1098 cm−1 are associated with stretching vibrations of the C-O bonds, located between the propane structure and the fatty acid chains of TGs. Finally, the signal at 722 cm−1 is due to the superposition of the oscillating vibration of (CH2)n, with n > 4 [66, 67, 68, 69].